Run Oregon loves running - that's no surprise. But we also love the Pacific Northwest and all that it has to offer. Running is a part of us, but it does not fully define us. In our new "Make a Day of It" feature, we aim to showcase some great local non-running events and highlight where to run and how to make the most of your experience! First the running: The most obvious place for those of you who like trail running is Tryon Creek Park. You can literally get lost on the trails there, however, so if you're not familiar with the park, I suggest you plan your route ahead of time and download or bookmark the Tryon Creek Park trail map on your smartphone for quick reference. Another nearby route begins and ends at the Jackson Middle School track and explores some of the surrounding neighborhoods, including a loop around West Portland Park Natural Area. You can add on some pleasant distance by running the trails of West Portland and Maricara Natural Areas. 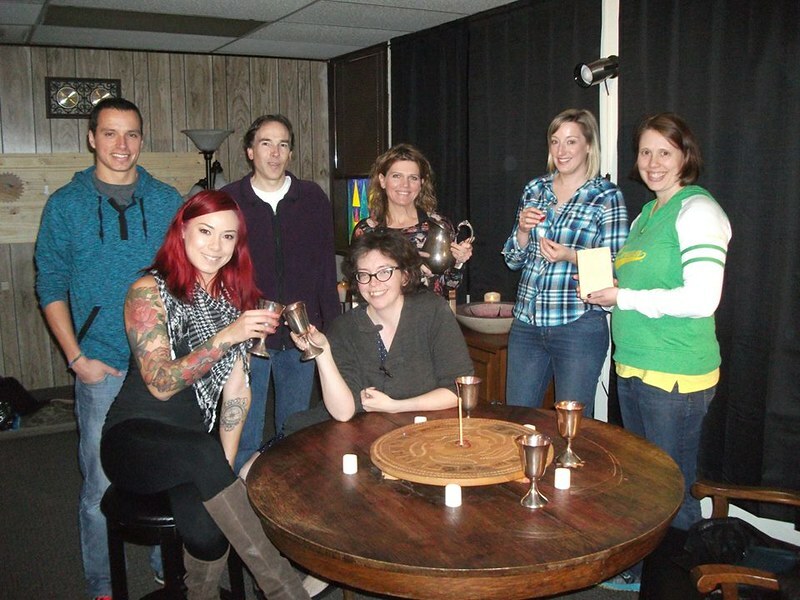 Kelly: The group of us met outside the location for Escapism Portland‘s “Ritual Room.” Rather than just have one business location, each of this company’s rooms are at different locations around the metro area. Rates for Escapism Portland’s escape room experiences vary by location and the number of people participating, approximately $15-45 per person for the hour. The “Ritual Room” happened to be in the old Oregon Dairy Center at 10505 SW Barber Blvd. in Portland, near SW Capitol Highway. It seemed weird to be meeting there, but it was soon apparent that it was a perfect location – an empty building has a creepy feel, and there was no distraction from neighboring businesses. At our appointed time, we were invited upstairs by a man wearing a sort-of old-timey costume, with a scar crossing over one eye and speaking with a thick accent. None of us had participated in an Escape Room before, and only one of us had read the FAQ. Unlike races, where we all geek out about reviewing the course map, mile markers, and porta-potty placement, we were all just ready to see where the experience would take us. Now, we can’t get into any of the details – we wouldn’t want to inadvertently give anything away – but immediately after we left, we all agreed that we needed to go back and do another one. I’ve already got a sitter lined up for my next attempt to “escape”… it’s possible I’m hooked. What makes it so great? Well…it’s mentally challenging, but not like anything else around. It’s not based on “smarts” or past experiences (although I’m sure you get better the more you do). It’s based on your willingness to be open to the experience, your ability to be observant and communication between your team members. It’s not a physical activity, so a good way to get non-running friends involved (let’s say you’re in town for a race and looking for something else to do…THIS), and it’s a departure from the usual calorie-laden happy hour or meeting up for dinner. So, without any particulars (because you have to go try this for yourself), here’s what the other six bloggers on our team thought! Marilyn: I once had a guy suggest an escape room experience for our first date, and I declined. I can be a little competitive when it comes to games and riddles, and combining that with getting locked in a room with someone I didn’t know seemed like it wouldn’t be terribly fun. However, when the opportunity came up to do this with the Run Oregon blogging team, I didn’t hesitate to sign up for a spot. It’s like being on an overnight relay team–there are friends, and then there are friends you know you can handle being with in a small space under potentially stressful circumstances, and the RO bloggers are my homies. The whole thing was SO MUCH FUN. Smart phones weren’t allowed (they probably wouldn’t have helped anyway), and physical strength wasn’t required. It was really challenging, and we were a bit shy of completing all of the riddles, but I can’t wait to do it again. Joe: Without giving anything away, one of the most fun aspects of this escape room experience was having very little idea what to expect. We were led into the room individually with our eyes closed and the lights out, so when it was time to begin, we all took a few seconds to look around at each other and our surroundings, and take stock of the room, before scattering to various corners to search for clues. It was pleasantly disorienting and a fun way to begin. Maybe I’m spoiled by the Run Oregon bloggers, but we made a great team, kind of organically looking things over and figuring things out without any real plan, and without anyone being especially bossy or critical of anyone’s ideas. We all contributed something to the effort, and although we didn’t quite complete the challenge, we made steady progress and for the most part things fell into place naturally through smooth cooperation. Though we were slightly disappointed that we had come sooo close, we all had a blast, and were united in our desire to try another one of these challenges ASAP! Brian: I find puzzles, riddles and brain teases quite entertaining. So to be locked in a room with some pretty clever people with life experiences and education of all types working together to achieve a common goal in an environment that was contrived without being overly campy was a blast. The trick was definitely to lose yourself in the experience and have fun working with your teammates. I had never done one of these before and would definitely like to try another one, and hopefully manage to escape! Robin: As I open my eyes listening to a disembodied voice explain the scenario, it became very clear that I had a new race against the clock to run. I had 60 minutes to figure out, with my group of running friends, how the heck to piece together the objects before me and the clues hidden within them. Part puzzle sleuthing, part theatrical entertainment and completely team building, we honed in on our communication skills shouting out the hopeful hints and tiny pieces of information we were finding and discussing how to put it all together…. but don’t chat too long. Before I knew it, in my frenzy to unearth some valuable piece of information, our group was informed that the first 15 minutes had passed. After this warning, we were reminded every ten minutes how far we really were from locating the key that would unlock the door that closed behind us. Can you beat the clock and the Run Oregon bloggers? We were about two steps and less than 10 minutes from locating the key… our facilitator broke out of character and started laughing “You WERE so close! So terribly sorry…” Escapism Portland currently offers three rooms for you to escape from with more themes being introduced next month. I soooo can’t wait. Abby: I wasn’t sure what to expect, especially since this was one of the first times I was joining all of my fellow bloggers for an activity outside of running. I was also a little nervous because I wasn’t sure how we would all work together to solve the puzzle successfully. Of course we didn’t solve it but I was impressed with how close we were to the answer and all of the awesome teamwork that went on. Besides being fun and mentally engaging, I think this would be a great communication building activity for groups who work together or a fun group-date that would be a refreshing and welcome alternative to the standard dinner and a movie. Teresa: I jumped at the chance to do something with my Run Oregon buddies, even though I had no idea what to expect. I discovered that I wasn’t the only one who didn’t quite know what an escape room entailed. The host gave us a little bit of the ‘historical’ background and the rules and asked if we had any questions, not a single question from our chatty bunch. He giggled a little and then gave us a general idea of what to expect. Let me just say that every single one of us left the escape room planning our next one, which says something. It’s fun! It’s not scary or intimidating and I was so relieved that nothing jumps out for a cheap scare. It’s simply solving clues with your teammates and having an absolute blast working together. My suggestion would be to make sure you bring someone smart, a taskmaster, someone with a knack for crossword puzzles/mechanical stuff, someone calm and patient to relax everyone when the time ticks and, most importantly, someone fun. We had all of the above and still didn’t quite make it out, but now that we know how it works I have no doubt we’ll escape the next time, even if we have to ask for a few clues.